Star Manufacturing, Ltd’s (Star) stamping plant is located in New Braunfels, Texas. It contains a QA laboratory, Tool and Die Shop, Shipping & Receiving, Engineering, Document Control, and General Office. Star Manufacturing has a variety of equipment that is used to manufacture the customers’ products. The equipment is selected around the needs of the product and the product type. 2 - 220 ton with 30" coil feed & pay-off reel. Bolster 48" x 72"
2 - 75-ton w/coil feed & pay-off reel. Bolster 24" x 36"
1 - 32 ton w/coil feed & pay-off reel. 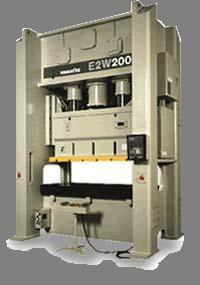 bolster 18" x 36"
All presses are equipped with load monitors and safety equipment. Star has the ability to stamp mild and high strength steels to manufacture precision products. Stainless steel, aluminum, brass, copper, and other metals are also available to the customer. Most of our materials are ordered direct from local service centers which gives Star a cost-competitive edge and quick response time. Carbon steel products can be of the pre-plated or post plated varieties, Nickel and Zinc are the most common post plated finishes. Zinc coatings are available in both hexavalent and trivalent conditions. Stainless products can be Passivated or Electro Polished when required. Aluminum can be Pre-Anodized in various colors prior to manufacturing if required or post-processed which is most common. Star utilizes local suppliers for decorative and protective finishes. These suppliers have long-term relationships with Star and have proven high quality and delivery standards. We perform powder coating in-house and have local sources for plating, painting and E-coat.